Fishing! We caught so many fish in one day, then we had a BBQ! 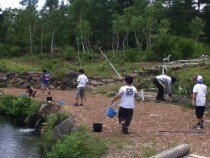 One grade 6 student joined camp and he gutted 20+ fish all by himself! Awesome! He was faster than me (Mr. Martinez)!! !